Brock Lesnar ends his UFC exile when he faces "Super Samoan" Mark Hunt at UFC on Saturday night. Will Lesnar make a winning comeback or will Hunt ruin the former champion’s return? 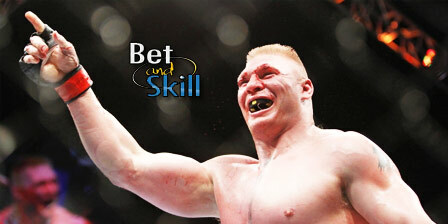 This article contains our betting preview on Lesnar v Hunt fight with tips, best odds, free bets and no deposit bonuses! It has been five years since Lesnar stepped foot in the Octagon. The 38-year-old WWE star returned to the world of wrestling following his last loss to Alistair Overeem via first-round TKO at UFC 141 on December 30, 2011. The wrestling legend enjoyed a rapid rise to the top of the UFC tree as he won the heavyweight title in only his fourth professional fight. His debut fight in the UFC was against Mir and the former champion capitalised on the newcomer’s recklessness to win the fight via submission. Brock Lesnar gained revenge 17 months later when he battered Mir on his way to a second-round TKO victory. Lesnar successfully defended his title twice with wins against Frank Mir and Shane Carwin, but a bout with diverticulitis slowed Lesnar's career down and eventually forced him into retirement. Mark Hunt (12-10-1) is a 42-year-old from New Zealand and has been a crowd favorite due to his heavy hands, which have led to nine knockout wins among his 12 overall. He is four years older and five inches shorter than his opponent but Mir and Silva are both at least as tall as Lesnar, and they were both dropped. The Super Samoan will try to keep Lesnar at striking distance, and take advantage of his opponent's rust with some heavy strikes. Lesnar will charge forward, hit with fists the size of your head and look constantly for the takedowns that fit his wrestling background. His only chance to beat Hunt is to get him down to the mat, because he has no business standing with the former kickboxing world championand we have seen in the past that Lesnar does not react well to strikes. This fight isn't likely to go the distance as 10 of Hunt's 12 UFC fights have failed to do so as have all but one of Lesnar's eight professional MMA bouts. Get 8/1 Brock Lesnar to win the fight + £100 bonus - Risk-free! Crazy boost! Back Mark Hunt to win @ 5/1! Enhanced odds - 8/1 Brock Lesnar to beat Mark Hunt! "Brock Lesnar v Mark Hunt predictions, betting tips, odds and free bets (UFC 200)"